Size Overall: 4.5 inches. Rosette measures 4.5DIA.xTxOA. By Darice Floral Arragement Supplies, Stems, Picks and Succulant Display Decorations and Decor, and Craft Items Collection. Size Overall: 5 inches. Rosette measures 5DIA.xTxOA. By Darice Floral Arragement Supplies, Stems, Picks and Succulant Display Decorations and Decor, and Craft Items Collection. Size Overall: 6 inches. Rosette measures 6DIA. By Darice Floral Arragement Supplies, Stems, Picks and Succulant Display Decorations and Decor, and Craft Items Collection. Size: Overall 5.5 inches. Rosette 4.5Wx1.75H. By Darice Floral Arragement Supplies, Stems, Picks and Succulant Display Decorations and Decor, and Craft Items Collection. Embrace bold style with our faux echeveria succulent. Size: Overall 7.5 inches. 5Wx5.875H. By Darice Floral Arragement Supplies, Stems, Picks and Succulant Display Decorations and Decor, and Craft Items Collection. Embrace bold style with our faux echeveria succulent. Size: Overall 4.75 inches. Rosette 4.75Wx1H. By Darice Floral Arragement Supplies, Stems, Picks and Succulant Display Decorations and Decor, and Craft Items Collection. Embrace bold style with our faux echeveria succulent. Size: Overall 5.5 inches. Rosette 3.75Wx2.125H. By Darice Floral Arragement Supplies, Stems, Picks and Succulant Display Decorations and Decor, and Craft Items Collection. Embrace bold style with our faux echeveria succulent. Size: Overall 6.125 inches. Cactus 3Wx4.25H. By Darice Floral Arragement Supplies, Stems, Picks and Succulant Display Decorations and Decor, and Craft Items Collection. 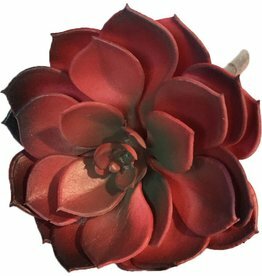 Embrace bold style with our faux echeveria succulent. Size: Overall 4.5 inches. Rosette 3.75Wx1H. By Darice Floral Arrangement Supplies, Stems, Picks and Succulent Display Decorations and Decor, and Craft Items Collection. Embrace bold style with our faux echeveria succulent. Size Overall: 3.75 inches. 4Wx35T. By Darice Floral Arragement Supplies, Stems, Picks and Succulant Display Decorations and Decor, and Craft Items Collection. Size Overall: 5 inches. 4Wx1T. By Darice Floral Arragement Supplies, Stems, Picks and Succulant Display Decorations and Decor, and Craft Items Collection. Size Overall: 5.5 inches. 3.5Wx1.875T. By Darice Floral Arragement Supplies, Stems, Picks and Succulant Display Decorations and Decor, and Craft Items Collection. Size Overall: 5 inches. 3.5Wx1.125T. By Darice Floral Arragement Supplies, Stems, Picks and Succulant Display Decorations and Decor, and Craft Items Collection. Size Overall: 7.875 inches. 4.75Wx3.25T. By Darice Floral Arragement Supplies, Stems, Picks and Succulant Display Decorations and Decor, and Craft Items Collection. Size: 10.5 inches. Winward Silks and Home Decor. Size: 9 inches. Winward Silks and Home Decor.